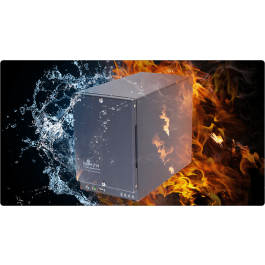 8TB fireproof waterproof NAS storage server, powered by Synology DSM. Best choice for RPO/RTO objectives and creating a private cloud network. 5 years of data recovery service support included. Fire Protection . . . . . . . . . . . . . . . . . . . . . . . . . . Protects data from fire. Up to 1550°F, 30 minutes per ASTM E-119. Flood Protection . . . . . . . . . . . . . . . . . . . . . . . . Protects data from flood. Fully submersed, fresh or salt water, 10 foot depth, 72 hours. Theft Protection. . . . . . . . . . . . . . . . . . . . . . . . . Kensington® Security Slot. Optional Floor Mount / Padlock Kit. Hardware Encryption Engine . . . . . . . . . . . . . Yes. AES-NI hardware encryption engine. Recovery Service. . . . . . . . . . . . . . . . . . . . . . . . (DRS). Upgradeable to 5 Year No-Hassle Warranty + 5 Years DRS. Certain limitations apply. See website for details. 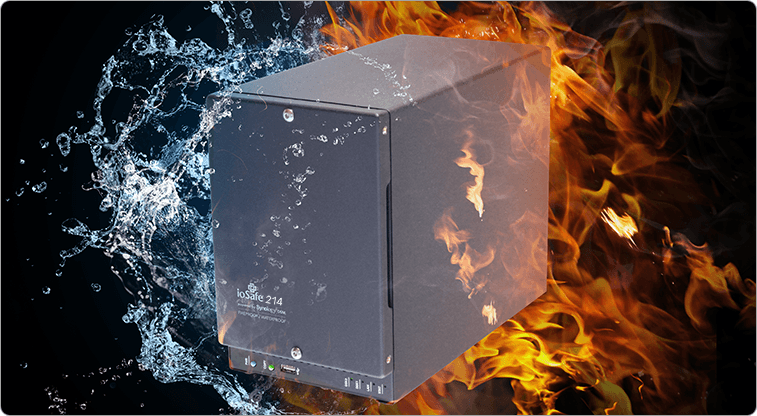 Fireproof — protects data from loss up to 1550°F for 1/2 hour per ASTM E119. Waterproof — protects data from loss up to 10ft depth for 72 hours, fresh or salt water. Redundant Drives (RAID) — protect from single HDD failure with mirrored drives. World Class OS — Powered by Synology DSM. Server, PC, Mac, Linux, smartphone and tablet apps.